“Chemistry” is an ugly word to use in musical partnerships. It means that neither partner will stay the same, that their organic contract will transform their individual properties so that both of them will be morphed to a new substance. So when you get two partners as accomplished, artistic, in a way even individually exotic as Leonidas Kavakos and Yuja Wang, expectations are high –unhappily high–that they might outdo themselves. Like two opera divas or a pair of 1940’s movie stars, they might move the goalposts, go around each other. Which ain’t the way Wang and Kavakos have ever worked. Singly or now together. The cerebral Greek-born Kavakos has never, in his many New York appearances, performed other than with deep-seated passion on his Strad. Beijing-born Yuja Wang is a larger-than-life personality, but her flamboyant fashion sense (she wore two bijou-sparkling backless gowns here) are only a diversion for piano playing which makes Rachmaninoff and Prokofiev seem easy, which turns Beethoven into a volcano of thoughts. Put them together, and you have an evening of four expansive works played with an ease and expertise which transcends mere chemistry. If the Brahms had one deficiency, it didn’t belong to the players...not exactly. Mr. Kavakos played his lines with fluidity, with attack, with an artful sense of melody and development. Yet there was no way he could win over Yuja Wang’s virtually symphonic piano-playing. No, she certainly didn’t overwhelm him with volume. Yet Ms. Wang’s grace, her rippling chords, the color she could achieve as (supposedly) accompanist made all ears on her playing. To some, entranced with the Yuja Wang extra-musical personality, her gorgeous playing was a surprise. To those who have heard her many times, she was all too much Yuja Wang. One might have longed for more theater, more contrasts in the second movement, something from these two unique players on the cusp of the idiosyncratic. No. They played Brahms with the composer’s own stolidity, even verisimilitude. It made for a respectful opening. Which made the Prokofiev First Sonata a thing of almost breathless intensity. This was great music, but it was doleful music. It started and ended with anguish. The meat of the work came close to anarchy, the Kavakos Strad almost violent. Ms. Wang’s funereal opening didn’t continue. But hers was the peroration behind Mr. Kavakos’ oracular statements, his high-string despondency. The Brahms was pure music, the Prokofiev was drama. We take our choice. The artists themselves knew what they were doing. Bartók’s First Rhapsody was made for Mr. Kavakos. The Athens-born artist would deny having the blood of Eastern Europe, but Greece has the modes, the tricky notes and slides and grace notes of Bartók’s purposely Magyar settings. So many settings in such a relatively short work! Ms. Wang understood that as well. Somehow–somehow–this Beijng-born pianist seems to inherit the most eclectic understanding, for this was a grand two-part work. One inevitably has questions why 30 minutes were devoted to Richard Strauss’s sole work for piano and violin. It is a meaty work, it has passion and color. 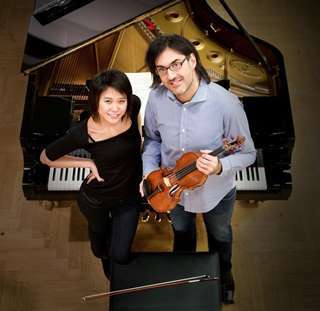 It had Mr. Kavakos’ passionate Improvisation second movement, albeit with virtually a cocktail pianism for Ms. Wang. The finale was a riproaring Don Juan electricity for both of them, though Yuja Wang was the winner with super-runs around the piano. Yet this is hardly one of the great violin sonatas of the repertory. Richard Strauss might have thought his violin was a Rosenkavalier soprano and his piano was a grand orchestra. But they were only that. One needed something more interesting, even more challenging for the duo. The encores filled the bill. First was more Brahms, the delicate intermezzo from the Third Sonata. Finally, though–and heaven help those poor listeners who left Carnegie Hall–was one of the Szymanowski Myths, this the “Fountain of Arethusa.” It was not only gorgeous playing, it was not only a celestial partnership of Kavakos and Wang, but the music was fascinating, rare, a personal frenzy of legerdemain and legend. And oh, how we could have used that instead of one stodgy Strauss Sonata. Oh well, the singularity of their partnership, the superb quality of their individual notes commingling with each other, gave a ravishing picture of both instruments and both dazzling instrumentalists.